Das Buch "Métier" von Zooeys Schwester Laura Braun wird ab dem 03. Dezember in ausgewählten Buchläden zu kaufen sein. Zooeys Schwester Laura Braun veröffentlicht ein Buch mit ihren Arbeiten über kleine Unternehmen in London mit, zum Teil, ungewöhnlichen bzw. aussterbenden Berufen. 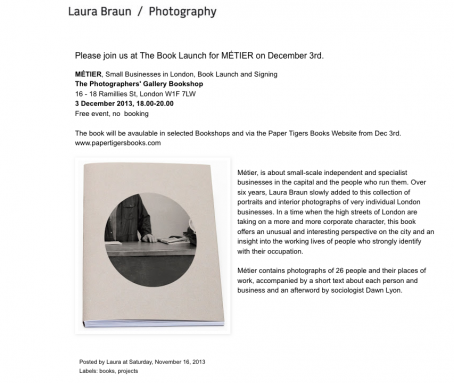 Laura: "Some of you will know that over the last 6 years I have been slowly working on a project about small-scale, independent, specialist businesses and the people who run them here in London. It has been a labour of love, a truly personal project, which I added to slowly whenever I came across another person or business that made me curious and which I wanted to let people know about. Now I am working on putting this project together as a book to be published via Paper Tigers Books in December. But making books is expensive and so I would like to ask for your help. I have started a crowd funding campaign on Indiegogo where you can essentially order the book in advance helping me raise the funds to produce it. 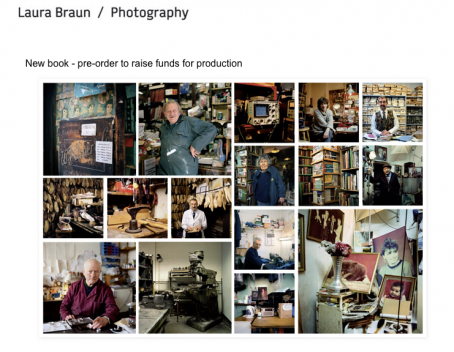 If you want to contribute a little more you can also order a limited edition print of one of the photographs from the project or a book and a print together. Please have a look at the campaign here, and at the facebook page here, support it and spread the word!"